A dangerous drone flew under the nose cone of an airliner in a ‘major incident’ near Newcastle International Airport. The incident is one of SEVEN near-misses involving drones and aircraft in the North East, it has been revealed. Overall in the UK there have been more than 300 near-misses between drones and aircraft across the UK even before the major disruption seen at Gatwick and Heathrow this winter. Drone collisions can cause catastrophic damage to aircraft, making them a real danger to planes and helicopters - and a great risk to lives. 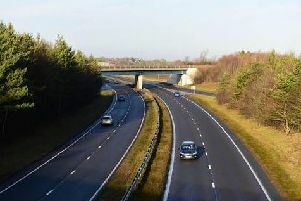 Of the seven near-miss incidents which took place in the North East, three took place in the skies above Tyne and Wear, two in County Durham and two in Northumberland. The region is served by Newcastle International and Durham Tees Valley Airports, as well as a number of smaller club and private airfields. In the most serious incident in the North East – listed as a category B major incident – the crew of a B777 climbing near Newcastle International Airport noticed an object which they initially thought to be a blackbird. Upon closing in, the crew identified it as a drone, but it was too late to avoid it and the drone passed “extremely close” just under the nose of the aircraft. An investigation report said the incident – which took place four nautical miles from Newcastle within the airport’s controlled airspace (CTA) – saw the drone pass just 100ft from the commercial airliner. The report states the aircraft was “climbing” four nautical miles from Newcastle, suggesting it had taken off from the city’s airport. Members of the Airprox Board, which examines incidents and looks to approve safety, said the drone had been operating at a height above that allowed by regulation. The board agreed the drone had been flown into conflict with the B777, causing a situation where safety had been “much reduced below the norm”. Another incident involving a commercial flight happened on September 11, 2017, when the aircraft was coming in to land at Durham Tees Valley Airport. Airprox said the drone was being flown at or beyond practical visual line of sight (VLOS) limits and was endangering other aircraft at that location and altitude.